The day demands focus and clarity. Part of the world blurs, becoming peripheral. 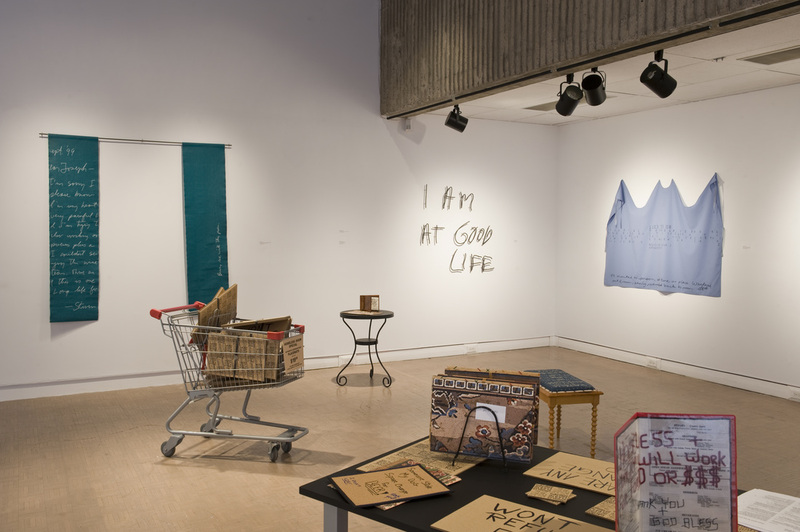 In Losing It at MSVU Art Gallery, three artists turn periphery into focal point. "This is beautiful," offers Kirtley Jarvis, looking down at the cardboard sign, with its magic-markered message, in her hands. The textile artist, from London, ON, has selected it from a box of bent and creased placards on the floor. She bought each one for five bucks from someone on the street. There is beauty in the signage (expressive lines and marks that suggest at the character of the messager). In their original state, the signs are "source material" for much of her installation, "Home Show for the Homeless." Jarvis hand-stitched the writing on cushioned stools, a restaurant menu, linoleum sections, in blocked patterns on cotton banners. "How does someone become so disconnected?" asks Jarvis. That question, and the idea that everyone treads between security and vulnerability, has propelled her for the past several years. In "The Good Life" (2001), Jarvis transforms a note left by her brother, a schizophrenic, into a wall-mounted statement made of welded steel rods: I am at Good Life. Hospitalization, particularly of the elderly, is a kind of homelessness. In "Portrait of Alzheimer's" (2002) Jarvis embroidered the information printed on her mother-in-law's hospital bracelet onto a hospital gown. "There's the indignity of the open back," she observes. Jarvis reproduced a nurse's handwriting, a stark line stating Patient is oriented to person not place or time. "What do you do with this information? It's devastating," says Jarvis, adding: "I found it therapeutic to do the hand-stitching. Just the act of making this helped me." This connects directly with Cheryl Pagurek's four-minute sound and video floor projection, "Flow" (2008). A psychiatrist or neurologist's assessment comprises the audio track. In it, the female doctor describes the 102-year-old man as he meets the standard: "He is disoriented to person, place and time." Pagurek, an Ottawa artist, based the work on her maternal grandfather. He was lucid and independent until he turned 100, "when he went abruptly downhill," she says. The dispassionate tone, measured cadence and mysterious terms ("altered sensorium," "probable delirium") and foreboding observations are familiar to anyone who's been through similar experiences. The sound intersects with moving image, a mix of family home movies from 50-plus years ago and footage from Pagurek's neighbourhood following a sudden thaw after a snowfall. She shot the resulting puddles, rotating and flipping the camera upside down to create a kaleidoscopic effect. "I was always interested in the presence of the past," says Pagurek, "the everyday, the commonplace, giving something validity that's usually passed over." Halifax artist Mary-Anne Wensley's work comprises a wall drawing and a series of motorized sculptures. The latter, "Coping Mechanisms," hint at their creator's presence, but the viewer activates them by touching, entering and interacting with each. In one, balloons filled with cornmeal gently rub the shoulders and neck, while another uses sheer fabric containing dried legumes to flutter about the head. A sensation akin to skin-crawling anxiety, or a soft breeze or gentle touch, the mechanisms make you aware of your senses' edges, the border between your body, the world and other people.